Although it is a very common disorder, many people know very little about eye stigma, or astigmatism. It may not even be noticeable to the person who has it, or they may attribute the small symptoms to some other condition. Over time, however, it can begin to create issues with your overall general vision health. The eye is an amazing organ. Highly complex, it consists of a multitude of orbital muscles, nerves, fluids, cells, blood vessels and more that all serve to assist the eyeball in the ultimate purpose of providing vision. Its processes are more easily understandable when compared to a camera, as the principles are quite similar. One of the major components of each is the lenses. In the eye, the first lens, the most obvious one, is called the cornea. Although it is invisible, it can be seen when examining the eye. The cornea is the clear portion of the eye that can be seen from the outside, covering the colored portion of the eye, the iris as well as the pupil. The purpose of the cornea, the most important lens in our optical schematic, is to protect the eye. 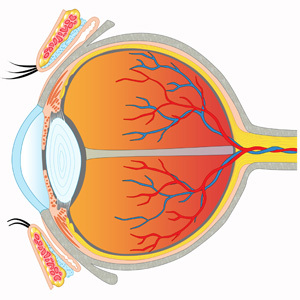 It also allows light to enter in through the eye; causing the light to bend and change paths in order to reach one point at the retina so it can traverse to the brain, resulting in our vision. The cornea is normally a dome shaped window, but in some people this shape can be altered by genetics. Eye stigma is the result when the cornea is more of an oval shape than the spherical dome as it the norm. The irregular football shape still allows light to enter into the eye; however, instead of the light being focused in the one area behind the eye, it focuses on two points. It is likened to a football because, like the sport ball, there is a steep curve and another that is flatter. Most people who are afflicted with astigmatism are completely unaware that they even have the condition. It can affect adults and children alike, as it is usually a hereditary condition. It can, however, be the result of an injury, disease or previous surgery as well. For children especially, it is particularly important to have an eye exam that can detect this condition; children are most often unlikely to be aware of blurry or unusual vision. Adults generally notice a decrease in good vision and seek optical advice. Two types of astigmatism exist. Regular astigmatism is a condition where 90 degrees separate the two curves. Irregular astigmatism is when more than 90 degrees separate the two meridians, or when there are more than two meridians. The result of the abnormality could be headaches, blurred vision or vision that is distorted. To correct eye stigma issues, an eye exam will first be performed to determine its type. Regular astigmatism is easier to fix than irregular types. Regular types can be amended with an eyeglass or contact lens prescription that will correct vision. Although more complicated, irregular astigmatisms can also be corrected with prescriptions unless the condition is quite severe. In some cases, surgery may be the best option available. The surgery is called refractive surgery, and eliminates the need for eyeglasses or contacts by reshaping the curvature of the cornea. Early eye examinations will be able to detect astigmatism in children, and make corrective measures before problems begin. Regular eye exams should be scheduled for both children and adults to monitor eye conditions and quickly diagnose astigmatism should it occur due to injury or disease. To keep vision optimal and problem free, it is important to maintain healthy vision.